Lace and Lacquers: WINNER WINNER CHICKEN DINNER! Pin It The Spring Break Giveaway has officially ended as of 24 minutes ago! Thank you EVERYONE for entering and following my blog! I have lots planned, more manis, more DIYs, more swatches and of COURSE more GIVEAWAYS! Thank you, each and every one of you, it means a lot - seriously! Well, Rafflecopter & Random.org have officially spoken! 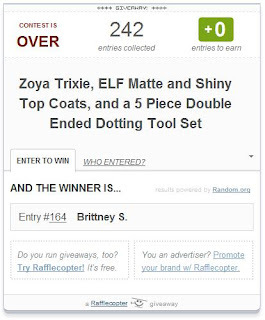 Congrats, Brittney S.! You have 48 hours to email me with your details, I have sent you an email! I will have your package shipped out by the end of the week! Until next time - Stay tuned!